Revisiting the Great Katrina Footprint Debate. New and rebuilt houses mix with vacant lots behind a strengthened flood wall in the Lower Ninth Ward of New Orleans. Moldy New Orleans still lay in ruins in January of 2006 as Joe Canizaro drove me to a favorite Italian restaurant of his in the city’s suburbs. It was a balmy Sunday, just four months after the catastrophic collapse of the city’s flood protection system, and Canizaro asked me a question I’ve never been able to answer. Canizaro — a big-name real estate developer in town — was due to deliver an official plan for redeveloping New Orleans the next day. But he confessed that he was still struggling with it. The question he asked was simple but profound: Should the authorities rebuild all of New Orleans after the flood? Or should they “shrink the footprint” and declare the lowest-lying areas of the city off-limits, converting large tracts of land into green space? The “Great Katrina Footprint Debate,” as Tulane University geographer Richard Campanella would dub it, became a long-running public tussle over people’s right to rebuild wherever they wanted, even if that meant they were putting themselves in harm’s way. Then-Mayor Ray Nagin had named Canizaro, a personal friend of then-President George W. Bush, to the panel he assembled to put together a plan for rebuilding New Orleans, where 110,000 homes and 20,000 businesses had flooded. Canizaro was a rich white Republican from the suburbs, equipped with Karl Rove’s cell phone number, who had been either brave or foolish enough to volunteer to put together the redevelopment plan — a job that his fellow panel members were happy to have handed to him. And he had turned to me — then a reporter for The New York Times “storm team” who had a tourist’s knowledge of New Orleans — to help him make up his mind. I would demur on that day. But for 10 years, I’ve been grappling with that question, first as a reporter for the Times and then as an author of a book about the rebuilding of New Orleans. Coming up with the right answer is for me as difficult today as it was then. Those who argued in favor of shrinking usually began by citing census figures. The city’s population had peaked at 627,525 people in 1960, but that was before the integration of the public schools and the white flight that saw 160,000 people leave the city over the next two decades. By the time of Katrina, New Orleans had an estimated 455,000 residents — and with maybe 100,000 left a few months after the storm, who knew, Canizaro and others were asking, if the population would get back to even 300,000? “It doesn’t take a genius to figure if you’re missing 40 percent of your original population, then there’s going to be shrinkage in the amount of land that’s going to be needed,” Canizaro said to me on New Year’s Day, 2006, with his big decision barely a week away. And yet he confessed that he wasn’t ready to declare a death sentence for any New Orleans neighborhood. Geographers didn’t seem to have any trouble reaching a similar consensus on the need to shrink the city’s footprint. Craig Colton, who taught geography at LSU, heard from colleagues around the country in the weeks after Katrina. To them, the only question was whether 20 percent or 40 percent of the city’s landmass should revert to wetlands. “I don’t know exactly where I would draw the line, but I assume that’s what the city is trying to figure out right now,” Colton had told me a couple of months after the storm. Roughly half the city sat below sea level, Colton said, but that didn’t mean he would decree half the city out of bounds. A community sitting a few feet below sea level might be deemed an “intermediate zone,” where people would be permitted to rebuild — if homes were jacked up high enough. “The city needs to choose some level below sea level and declare it economically unfeasible to build in areas that are at that elevation or lower,” he said. Colton’s colleague Bruce Sharky, a professor of landscape architecture at LSU, specialized in land use issues. Sharky, too, said he thought it would be irresponsible to rebuild all of New Orleans. He started making regular trips to the city shortly after the floodwaters receded (accomplished in three weeks despite the U.S. Army Corps of Engineers’ estimate that it would take at least 80 days). 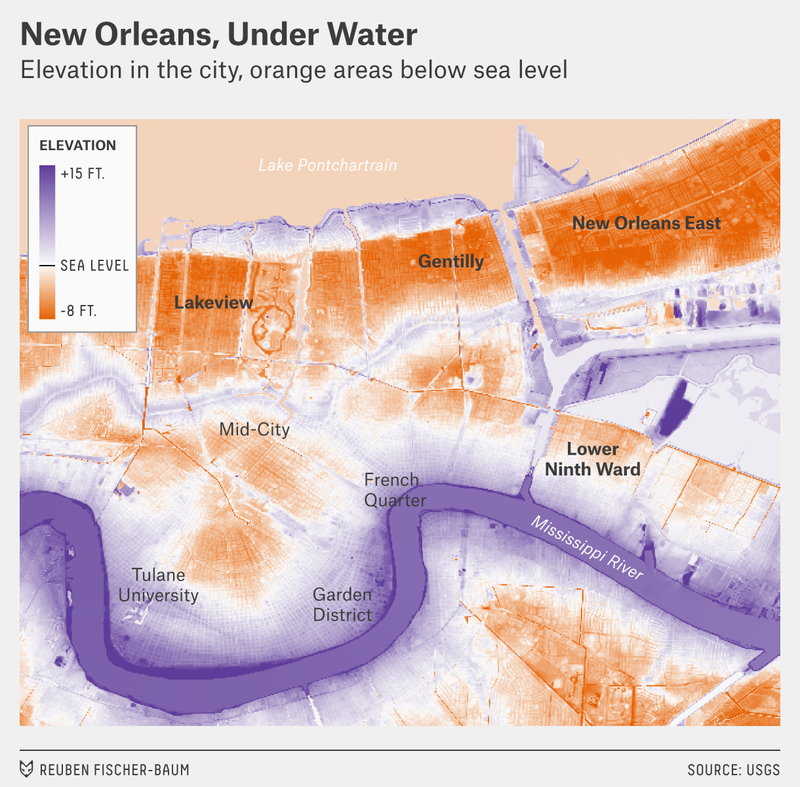 He had seen the enormity of the disaster that had befallen New Orleans East, parts of which sat 7 feet below sea level, and Lakeview, a neighborhood on the west side of the city where the average home sat 3 feet below sea level. Money was very much on Canizaro’s mind in early 2006. He asked me to imagine the cost of providing police, fire protection, garbage pickup, and other city services to half-built neighborhoods in low-lying New Orleans. Every expert was telling him the same thing: The city couldn’t afford to let every last neighborhood come back. Fewer people meant less tax revenue and therefore less money to spend on everything from police and fire to street repairs. Yet by that point, Canizaro was admitting that it was inevitable that he would duck the tough call and not prohibit low-lying neighborhoods from rebuilding. He was a white man leading the redevelopment of a city that was two-thirds black. Of the 353,000 people living in a part of the city that flooded, 265,000 were black. Race was a vital element of the Great Footprint Debate — and for me (also white), it turned a hard decision into an impossible one. For decades, racial covenants and discriminatory lending policies in the city meant black homeownership had been restricted to only a few neighborhoods. Barbara Major, the co-chairwoman of the mayoral panel on which Canizaro served, noted that there was a reason why so many black families lived in New Orleans East, as she did, and in other low-lying parts of the city. “Black people only moved there because all the high ground had been taken,” said Major, who is black. John Logan, a sociology professor at Brown University, broke down by race (and other factors) the makeup of the blocks that Canizaro’s experts wanted to leave uninhabited. They were talking about land that housed 80 percent of the city’s black population. What do you tell those residents, many of them longing to return home? “Look, sorry, we know that was the only land where you could pursue the dream of homeownership, but you’re going to have to find another place to live?” New Orleans East was mostly swampland in the 1960s when developers started building in the area. By 2005, it was home to 96,000 people, or one-fifth of the city’s population, and it was where much of the city’s black middle and professional classes lived, along with a large portion of its black elites. “It would kill the black psyche if New Orleans East isn’t rebuilt,” said Tangeyon Wall, who, along with her husband, had bought a home in one of the area’s middle-tier subdivisions in 1991. There were other issues, of course, starting with property rights. “This is America” was a popular refrain voiced by black and white residents alike during the debate over the city’s future. If they had the money, people said, who was the government to tell them they couldn’t rebuild? The solution devised by Canizaro was borrowed from the outside planners in plentiful supply in New Orleans in those first months after Katrina: Arm communities with the same elevation data the government had been using when it considered turning large parts of the city into green space. Give them access to the same range of planners and demographers and geologists that were advising Canizaro. Each neighborhood would then have four months to submit a plan that proves its long-term viability. But how do you define “viability”? Was it a commitment from 50 percent of a community’s residents that they would rebuild? Seventy percent? The impracticality of making these choices helped doom the plan, which was immediately unpopular in the city. Nagin rejected the proposal because he was in the middle of a tough re-election campaign. His good friend David White, another suburban resident on the rebuilding panel, was among those telling Nagin that to embrace Canizaro’s plan was to commit political suicide. In the end, no neighborhoods were declared off-limits. But driving around New Orleans these days, it’s still not obvious that was the correct answer. Lakeview, a prosperous white community, looks better than it did before the storm. Some residents have elevated their houses, and the city is now better protected than it was pre-Katrina, after the federal government spent $14.5 billion to rebuild the levees. Yet those I spoke with estimate that New Orleans East is only about 80 percent back, and that the Seventh Ward, a black working-class neighborhood, is maybe 60 percent back.2 In the Lower Ninth Ward, where the average resident was living on $16,000 a year before the hurricane, the population is only 36 percent of what it was. In many of those neighborhoods, there are only a few houses on some blocks, raising the same questions about the long-term cost to the city of providing services. Jeff Thomas, a lawyer who worked in a special unit run by the city’s recovery czar in the first years after the flood, looks back on the Great Debate as a high-minded argument with no basis in reality. He sees the idea of seizing people’s property as “a nonstarter, constitutional law-wise, and also because of funding issues.” Over coffee earlier this year, Thomas laid out the steps the city would have needed to take before bringing in the bulldozers and converting a neighborhood back to swampland. According to The Data Center of New Orleans, the U.S. government spent $120.5 billion helping the Gulf Coast after Hurricane Katrina. The majority of that money — approximately $75 billion — went to emergency relief, not rebuilding. These numbers refer to estimates of commerce, amenities and population.